Last time we hiked Sunshine Meadows during larch season, we went a couple of weeks too late for prime time gold. This year, our timing was just about bang on. Red and orange leaves on wildflowers and shrubs enriched the autumn landscape, while rolling clouds added a bit of drama to the views. Only consistently blue skies could have made for a more picture perfect day. The gondola option we took for our summer hike to Citadel Pass stopped running after Labour Day weekend. Instead, we booked tickets on the shuttle bus service operated by White Mountain Adventures. Although reservations are recommended, our 9 o’clock bus wasn’t full, even after the last-minute addition of several walk-up customers. 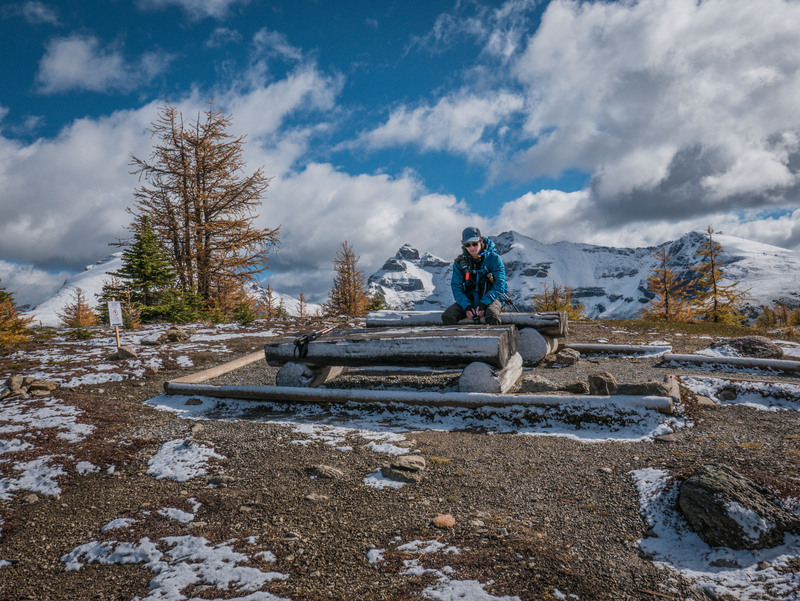 As we talked about trail options during the 5 km/20 minute bus ride from the parking lot to Sunshine Village, we realized that each time we’ve hiked the Sunshine Meadows loop we’ve hiked counterclockwise. After confirming the sun position relative to Rock Isle Lake, we decided to change it up and hike clockwise. Departing Sunshine Village on foot, we spotted golden larch trees as soon as we veered left just past the log cabin. The light dusting of snow and lingering frost perfected the iconic “fall in the Canadian Rockies” scenery. Our first extended stop was at the viewpoint above Rock Isle Lake. Since our since our last visit here a few months ago, stakes and ropes have been installed to prevent/discourage visitors from leaving the approved trail to get a better photo angle. They have been carefully placed to include select areas where too many footprints have basically killed off the fragile alpine vegetation and seemed to us to strike a pragmatic and reasonable balance. We came across several similarly roped-off photo spots on the trail between Rock Isle and Larix Lakes. We were the first people to visit Rock Isle Lake on this particular morning. We were patient, timing our shots to take best advantage of the mixed sun and fast-moving clouds. As we left Rock Isle Lake my straw hat fell off. I didn’t realize it, because I was stylin’ two hats at once and my toque was still securely on my head. So I was pretty surprised when I heard a female voice start speaking and even more surprised when I heard here say, “I knew I recognized this hat.” Turns out it was someone who’s been reading this blog for a while, and that it was a post about one of our earlier visits to Sunshine Meadows that first inspired her to visit during larch season. I was so astonished that I forgot to thank her properly, so “thank you” for tracking me down and returning my long-time favourite hiking hat! We were hoping to be back in the parking lot by about 2 o’clock, so we only hiked about 0.5 km along the trail towards Larix Lake before turning back. This trail segment offers several other perspectives of Rock Isle Lake and some decent views towards The Monarch. Our next stop was Standish Viewpoint, which provides an almost bird’s-eye view of Rock Isle, Larix and Grizzly Lakes. While Mr. GeoK and K composed a bunch of panoramas at the viewpoint, I hiked short the loop to the top of the Mount Standish lift and back. It was the first time any of us hiked the approximately 0.5 km loop. I thought the view towards the Continental Divide lift and Goat’s Eye were well worth the small extra distance. We saw a surprising number of larches plus some lovely little tarns and creeks on the Twin Cairns/Meadow Park Trail between Standish and Monarch Viewpoints. Instead of hiking Wawa Ridge, we walked about 0.5 km along the trail to Healy Pass. It was very muddy, but we found a good spot, out of the wind, for a quick lunch. Once we started back towards Sunshine Village, we hustled along in order to catch the 1:30 shuttle bus down. We encountered several groups of 4+ people going the other way and stopped just a few times for photos. We made it! This time of year, the last shuttle down departs Sunshine Village at 4:30 pm. Be sure to check the website for a detailed schedule. This was an absolutely beautiful half-day hike. We saw golden larch just a few days past their absolute prime (probably would have been a couple of days before absolute prime the weekend before). Looking to The Monarch got me thinking about hikes for next summer and a return to Healy Pass tops the list. This was our only larch season hike in 2016. 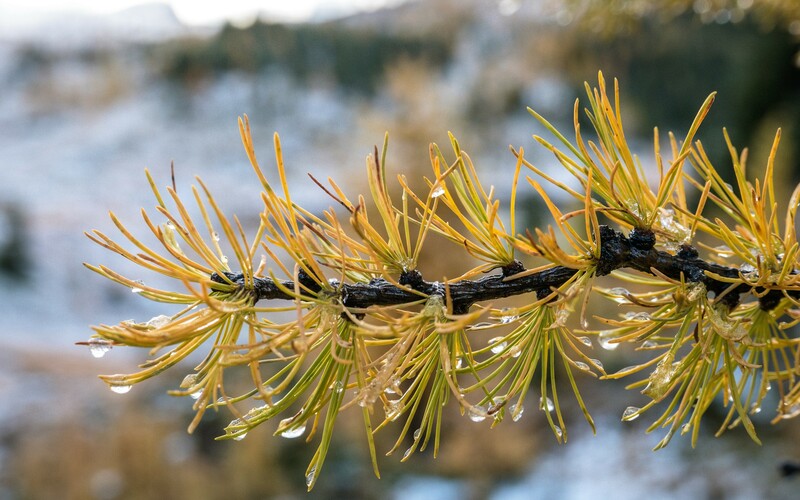 Did you get out to view the larch? Which trail is your favourite? Glad to know your name! I didn’t remember my manners for two reasons: first, I hadn’t noticed my favourite hat was no longer on my head; and second, because someone recognized me (or at least my hat) from reading this blog! Apologies for not making proper introductions. Hope you enjoyed your hike. Grizzly Ridge is a perpetual favourite with us…love that view over into Paradise Valley. BEAUTIFUL photos! As you know, I did Pocaterra Ridge along with my lady hiking friends and Hike, Bike, Travel blogger Leigh McAdam. It was amazing!